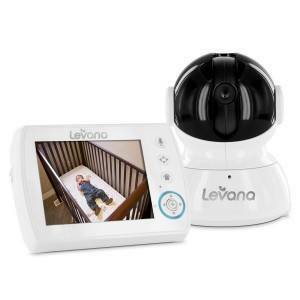 What Features are Available on Video Baby Monitors? Home » 🛡️Safety & Health » Baby Monitors » What Features are Available on Video Baby Monitors? Back in 1937 Isamu Noguchi, the famed Japanese-American sculptor who popularized the ubiquitous coffee table created the very first baby monitor for the Zenith Radio Corporation. Called the “Radio Nurse,” it was designed at the behest of Zenith president E.F. McDonald Jr., who was apparently mindful of the Lindbergh baby kidnapping in 1932. Like today’s far more advanced baby audio monitors, the Radio Nurse consisted of two main components: the “Guardian Ear” transmitter used at baby’s crib and the “Radio Nurse” receiver. It was constructed from Bakelite plastic — the first synthetic plastic, created in 1907 — which is still used today to impart a “retro” appearance to consumer items like double-edged safety razors. Noguchi chose the Bakelite for his new invention because of the plastic’s nonconductivity and its resistance to heat. While the Radio Nurse proved to be a commercial disappointment due to the fact that it would indiscriminately receive radio broadcasts, the die was set for the use of wireless baby monitors in the decades to come. Nowadays, of course, baby monitors have evolved to include video capability. But there are also other features available, so many that it’s useful to examine the range of monitor capabilities in order that parents and caregivers can determine the features essential for their needs from those that are superfluous. Note that not every monitor has every feature and that products with similar features can vary widely in price. Other trendy features common to the new generation of baby monitors are two-way talkback capability (where parents or caregivers can talk to baby in the crib via a built-in microphone and speaker in the camera), a selection of lullabies to soothe baby to sleep, nightlights and a temperature sensor to ensure baby’s comfort. The use of “PTZ” (pan/tilt/zoom) cameras to monitor baby’s activities is also a feature found on top shelf baby cams. Even here differences between models can found, as manufacturers will tout their products featuring 4x zoom over the standard 2x zoom, the tilt and panorama capability of their product, multicolored nightlights or the number of lullabies available to choose for baby’s slumber. While it’s easy for parents to immerse themselves with these bells and whistles (is 110° vertical tilt sufficient or is 130° needed? ), what’s most important is the reliability and durability of the product, video and audio quality and interference-free signal transmission. Also note that there is a wide variance in the battery life of these products, as well as a signal range — an important consideration if the parent or caregiver carries the monitor throughout the house or office. Another feature worth examining is the VOX activation; if a baby is sleeping, the camera goes into dormancy mode. Once the baby moves or cries, the unit is activated. This feature saves hours of battery life and prevents frequent unit recharging. While there are dozens of professional reviewers of video baby monitors, many of whom are paid to write about a company’s product, the best resource is the feedback given by Amazon customers. Those who are interested in a particular product will likely find dozens if not hundreds of reviews from these consumers. The main difference between a professional reviewer and a parent who “field tests” a company’s product is time. While a reviewer may evaluate a product over a night or a weekend, many Amazon customers report a product’s reliability and durability over a longer interval of time. For example, most professional reviewers have no idea if a specific product typically quits working after six months or the level of product support and customer service a manufacturer provides. So is a hygrometer really necessary to check for the humidity level in baby’s nursery? If the answer is yes, you’ll find a video baby monitor that caters to you and your baby’s needs. The video baby monitor market is a crowded place with many products available. Know what you and your baby’s needs are, then the features you want, and finally, the price one wants to pay. By evaluating all these factors, you’ll reach a decision on a video baby monitor that addresses your particular application.